(pictured left to right) Taylor Richards – Mental Attitude Award. Zach Burkholder – Captain, MVP. Jacob Strehler – Gold Glove Award, Cy Young Award. Nathan Mullen – Batting Champion. Reece Willis – Rookie of the Year. Not pictured: Zach DeBaets – Captain, All-NIC Academic Honor. 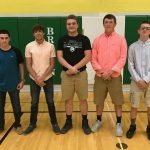 Saturday, May 13, 2017 11:00 AM Bremen High School AWAY 5 South Central HOME 3 Game Recap Pitchers — South Central, RJ Snyder (L), Kyle Schmack (6) Bremen, Damon Young (W) 2B — Kyle Schmack (SC), Jacob Strehler (B) Reece Willis had 3 hits and Art Chapman had 2 hits and 2 RBIs for Bremen.